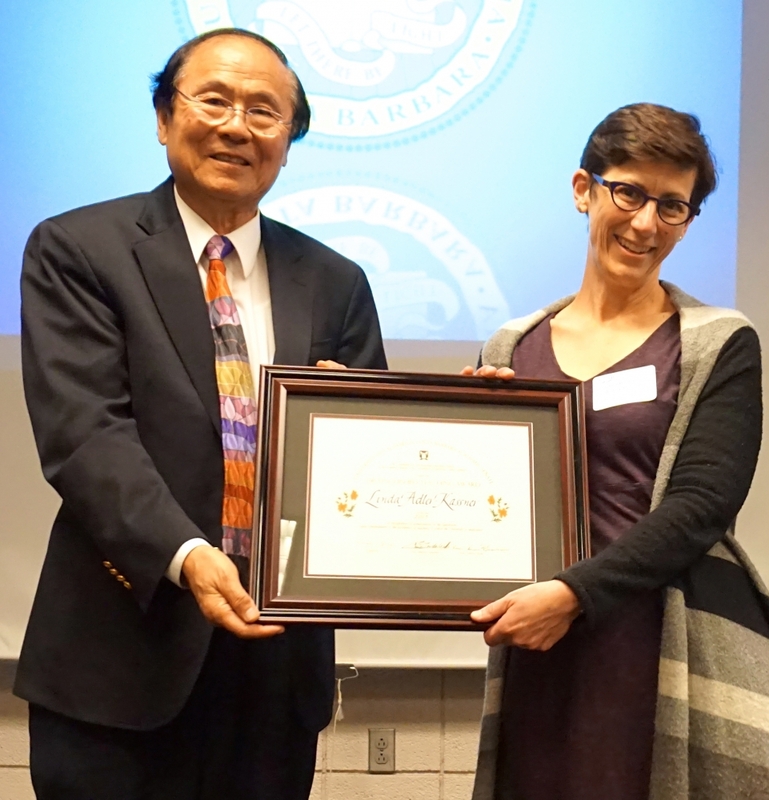 Chancellor Henry T. Yang congratulates Mary Furner on her Outstanding Graduate Mentor Award. 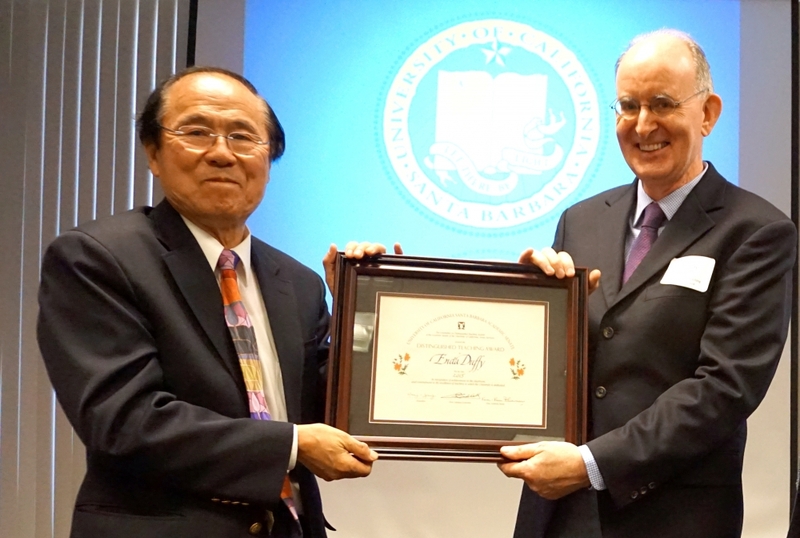 English professor Enda Duffy receives his Distinguished Teaching Award from Chancellor Yang. 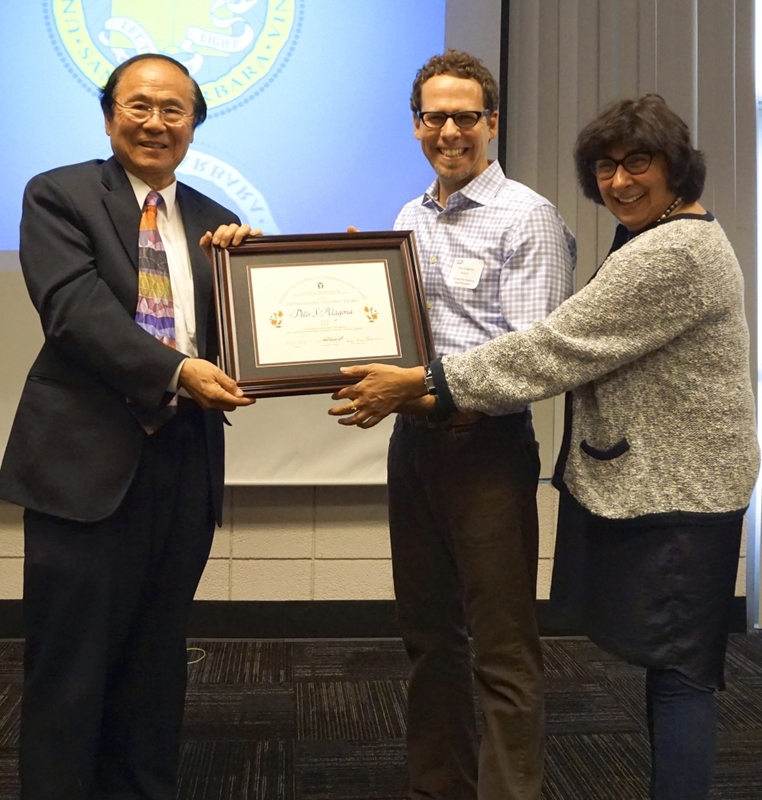 Francesco Bullo accepts his Outstanding Graduate Mentor Award from Chancellor Yang and Academic Senate chair Kum Kum Bhavnani. 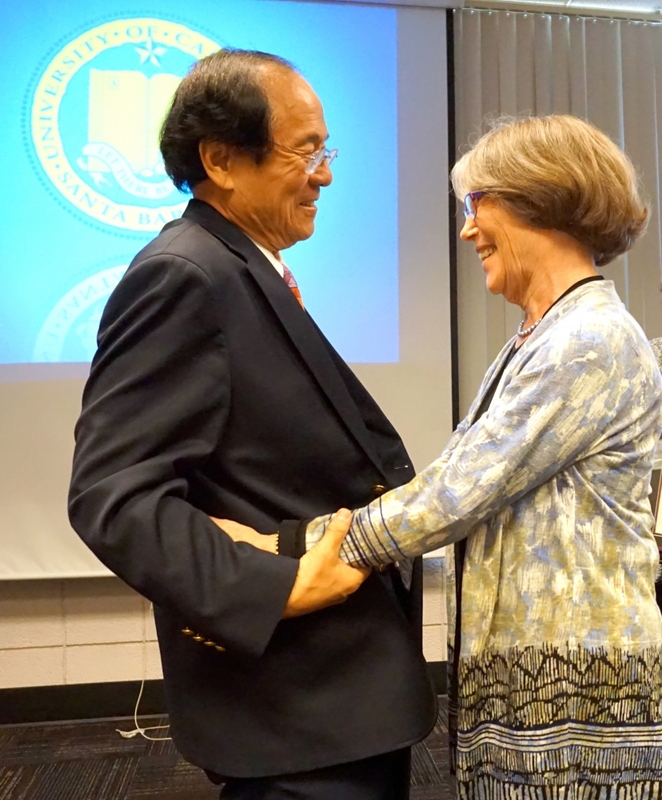 Linda Adler-Kassner accepts her Distinguished Teaching Award from Chancellor Yang. 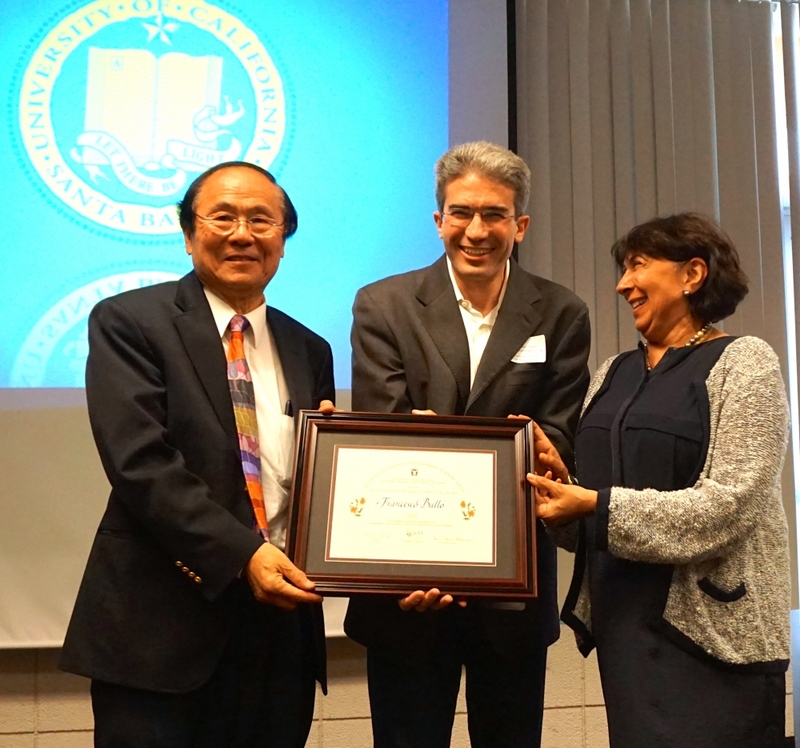 Chancellor Yang and senate chair Bhavnani present Peter Alagona with his Distinguished Teaching Award. 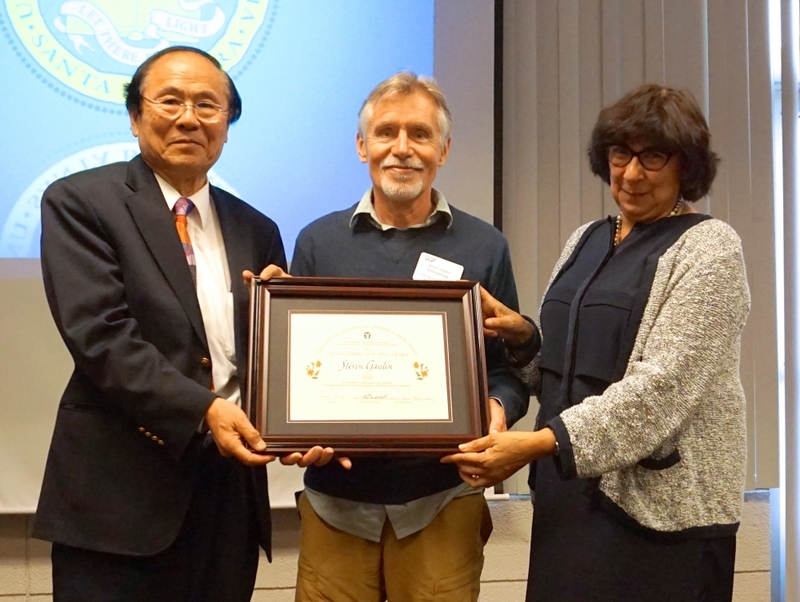 Anthropology professor Steven Gaulin receives his Distinguished Teaching Award from Chancellor Yang and senate chair Bhavnani. 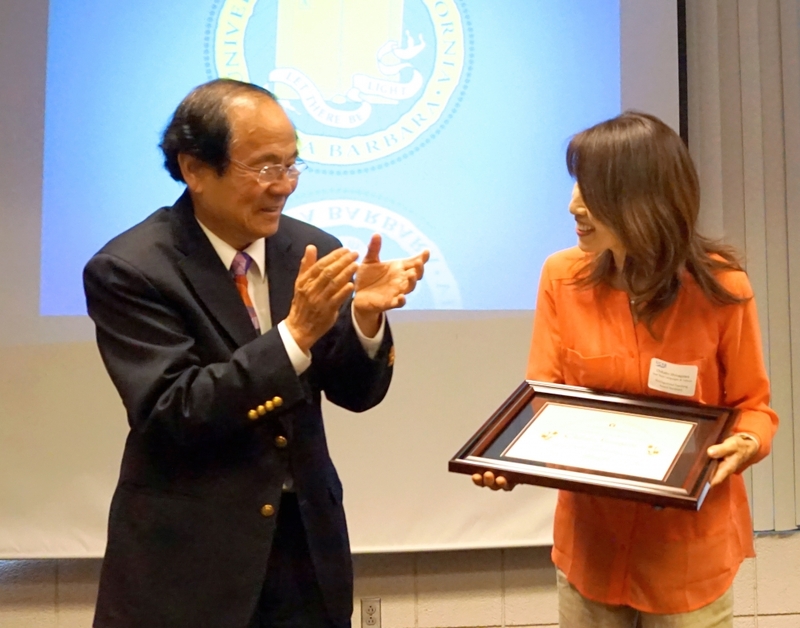 Chancellor Yang applauds Chikako Shinagawa for her Distinguished Teaching Award. 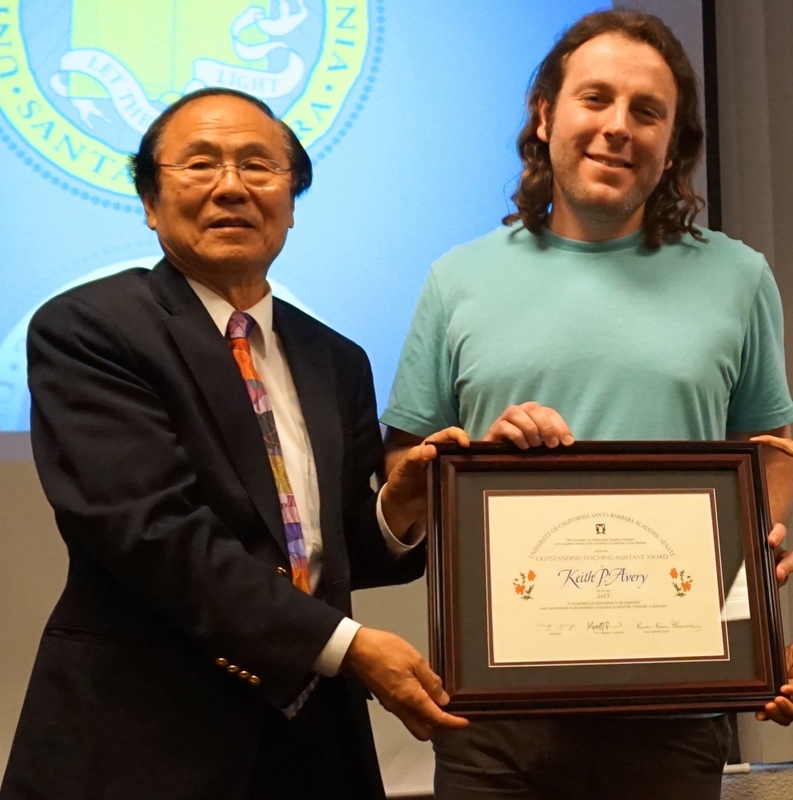 Keith Avery picks up his Outstanding Teaching Assistant Award from Chancellor Yang. 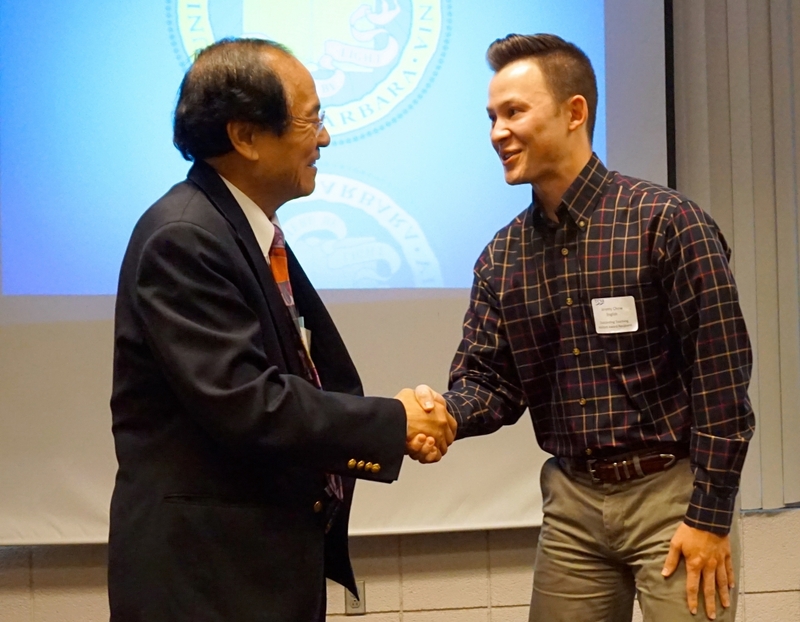 Recognized with an Outstanding Teaching Assistant Award, Jeremy Chow shakes hands with Chancellor Yang. 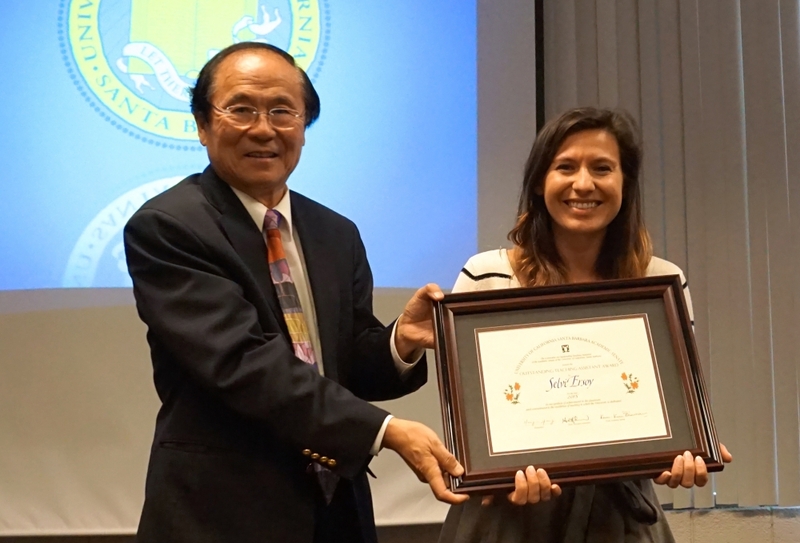 Selvi Ersoy poses with Chancellor Yang and her Outstanding Teaching Assistant Award. 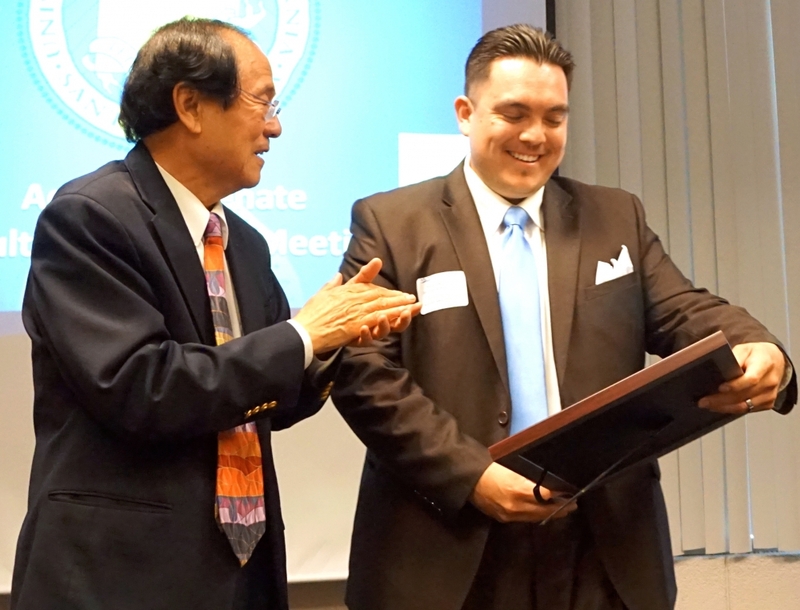 Chancellor Yang applauds Mario Galicia, Jr. on his Outstanding Teaching Assistant Award. The Academic Senate opened its April 23 Faculty Legislature Meeting with the presentation of its 2014-2015 awards for teacher, mentors and teaching assistants. The Senate previously announced the winners of the Faculty Research Lecturer and of the Harold J. Plous Award: Linda Putnam, a professor in the Department of Communication, and Krzysztof Janowicz, an assistant professor in the Department of Geography, respectively. Stanley Awramik, professor in the Department of Earth Science, announced the six recipients of this academic year’s Distinguished Teaching Awards, which acknowledge the efforts of Senate faculty members who have successfully united teaching and research. Non-Senate faculty are judged on their excellence in teaching and their contributions to the teaching mission of the university. Peter Alagona, associate professor in the Department of History, began his career at UCSB in 2008 with a joint appointment in the departments of history and environmental studies. He is described as “a superb teacher who is motivated, energetic and committed to keeping his instruction on the cutting edge of content, delivery and outcome.” He oversees senior theses and regularly delivers guest lectures in other courses, demonstrating that he is in demand both as a lecturer and a team player. English professor Enda Duffy has been a faculty member in the Department of English since 1993. He is noted for being “one of the most dynamic and versatile teachers in the department” and makes significant contributions to departmental curriculum. In particular, he is praised for building a new model for offering large lectures, one that accommodates significantly more students while maintaining consistently high student evaluations for the quality of his instruction. Steven Gaulin, professor of anthropology, received particular praise for his teaching of Introduction to Physical Anthropology, which one student described as “a unique and innovative course, due to Professor Gaulin’s efforts.” He uses a variety of multi-media enhancements to offer an engaging and pioneering educational experience to large lectures. He works to keep the material engaging for the broad array of general-education students who take this class, offering challenges and insights for students at all levels of preparation. Academic Senate chair Kum Kum Bhavnani, a sociology professor, introduced the three winners of the Outstanding Graduate Mentors Awards. Francesco Bullo, professor and chair of the Department of Mechanical Engineering, has had an incredibly strong track record in the mentorship and guidance of many graduate students, both in a research context as well as in a service role, as chair of the graduate program, a role he held for many years before becoming department chair. One of his former students who now holds an assistant professor appointment said of Bullo: “I cannot imagine a better advisor and mentor. Four graduate students were singled out from the many applications for Outstanding Teaching Assistant Awards. Mario Galicia, Jr., a Ph.D. candidate at the Gevirtz Graduate School of Education, has been a TA for a number of black history classes, as well as courses in sociology and Chicano and Chicana studies. One professor described him as a “pedagogical genius” and asserted, “He knows how to translate abstract and complex theory and methods into palatable lessons that freshman can understand and thrive on.” He constantly receives top student evaluations and students consistently rave about him.